Who is Evergreen Pest Management? Edwin “Ed” Belding established Evergreen Pest Management in 1996. Ed took what you might say was a circuitous route into the pest management world. In 1990, Ed was laid off from his job at an airport. He soon took a job as a delivery truck driverIt didn’t take Ed long to realize that, for him, the job had no real future. So, he continued his journey, look for the right occupation, the right profession for him. A time came when Ed experienced an infestation of ants in his home. He began the search to find someone to eradicate the pests from his home. It was during this search process that Ed was hit with the idea that maybe pest management could be his calling. In 1995, Ed began to investigate the requirements for owning and operating a pest control business. Later that year, he finished his initial education, successfully completed and passed the required testing, and received the required licensing in the field of pest management. 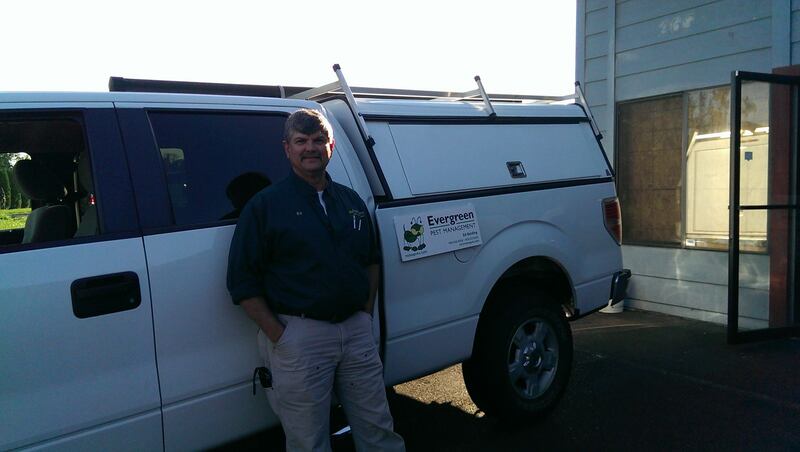 In 1996, Ed obtained a business license and officially started Evergreen Pest Management. In order to maintain the outstanding level of service Evergreen Pest Management clients have come to expect, Ed and the team at Evergreen continues their education by attending industry-related classes and seminars. This is vitally important in the field of pest control in order to stay current with industry techniques, tools, and trends. In addition to the ongoing industry-related education, Ed and the Evergreen team also participates in training in business operations and customer service, in order to not only remain competitive in the marketplace, but to set Evergreen Pest Management apart from the rest of the industry. As the owner of Evergreen Pest Management, Ed has a 20-year track record for an established standard of quality of service that is both ethical and dependable. Ed personally addresses any and all client issues that might come up. The buck stops with Ed when it comes to customer service. As a result, Evergreen Pest Management has developed a reputation for high quality service that is professional, dependable, courteous, and sensitive to the very real needs of its clients. We continue this quality through our participation in the community and are a proud member of the Tualatin Chamber of Commerce. The business continues to thrive and now services Portland, Tualatin, Wilsonville and Salem. For a full list of locations see our service map. By utilizing the Integrated Pest Management system (IPM), Evergreen Pest Management effectively control insects around homes or businesses, with the safest and least evasive processes available. Call us today and let Ed and the team turn that philosophy into a reality for you, your family, your home, or your business.